The agriculture sector is the fourth largest contributor to GDP (8.7 percent) and the largest contributor to employment. The sector is critical for achieving diversification, economic growth and poverty reduction in Zambia. One major component of the agriculture sector is the e-voucher programme, which was allocated K1,785,000,000 in the national budget (Farmer Input Support Programme – FISP budget line). The e-voucher system has had its challenges and with the intervention of the Smart Zambia, there could be light at the end of the tunnel. The Government in June, 2018 did announce that some farmers would this farming season of 2018/19, be reverted to the conventional FISP to enable Government resolve challenges associated with e-voucher administration. About 55 districts are earmarked to be captured translating to about four hundred thousand farmers of the one million targeted farmer beneficiaries. Some of the challenges faced last farming season in the administration of e-Voucher especially in rural parts of the country included among others: poor network connectivity, delayed card activation, lack of capacity by agro-dealers to stock enough inputs to meet demand and long distances covered by farmers to the nearest agro-dealer. Use of electronic voucher (e-voucher) cards with Government engaged banks. Use of electronic voucher (e-voucher) cards with a proxy bank. It is important to note that all the 3 modes are still electronic and differ slightly from the old conventional FISP which involves the use of paper in addition to farmers being required to append signatures on hardcopy registers. Government through the Zambia Integrated Agriculture Information Management System (ZIAMIS) hosted by Smart Zambia has developed a new module, which will enable farmers to access inputs without use of the electronic voucher (e-voucher) cards. This measure mostly targets FISP beneficiary farmers in areas that had network problems and were affected by lack of input availability and long distances to the nearest agro-dealer. Government has specifically procured fertilizer which has been stored in sheds across the targeted 55 districts where this program will be implemented. To access the fertilizer, farmers will first need to collect the Authority to Deposit (ATD) codes from the office of the District Agriculture Officers (DACOs) after which farmers will then be required to deposit their K 400 contribution at any bank engaged by Government to roll out the program. Once the deposited money reflects in the Government account, DACOs will then issue farmers with the Authority to Collect (ATC) codes which enables these farmers to collect fertilizer at any of the Government sheds nearby in the districts under consideration. Government fertilizer sheds are using a Biometric system to verify farmer records through ATC Codes. The Biometric system has an advantage of being operational even in areas without internet connectivity because it relies on satellite signals. We have noted that the ZIAMIS system has now been upgraded and will only take a maximum of four hours for deposited money to reflect. However, farmers are still being encouraged to collect their inputs a day after collection of ATC codes to allow the system to fully synchronize and update the records. Under this mode, a FISP beneficiary is expected to first deposit K 400 mandatory farmer’s own contribution with a Government engaged bank; money which reflects immediately after depositing in the e-card. A day or two later the bank will then upload K1, 600 [FISP amount per farmer beneficiary] onto the farmer’s e-card as soon as authorization is granted by Government. The farmer is then free to go and collect inputs at any agro-dealers of choice. Using electronic voucher (e-voucher) cards with a proxy bank. Farmers in areas without presence of Government engaged banks can still make deposits with a proxy bank in the areas and get their inputs almost immediately. Under this mode, a FISP beneficiary is expected to first deposit K 400 with a proxy bank. The proxy bank is then expected to forward the money to a Government engaged bank. The moment such a bank to bank transaction is affected, ZIAMIS system will receive a notification and an ATC code is then issued to the farmer immediately through a mobile text message or can be accessed from the DACO. With an ATC code a farmer can now collect inputs of preference from any agro-dealer of choice. PMRC remains hopeful that these new e-voucher administrative measures put in place by Government will continue to reinforce the initial reasons that led Government to move away from the conventional FISP. We hope the new FISP measures will be cost effective to administer, promote crop diversification, improve timeliness in inputs distribution, improve the quality of inputs, build private sector capacity in inputs marketing and distribution, provide means to easily introduce farm risk mitigation measures and ultimately improve household and national food security as well as farm incomes for smallholder farmers. 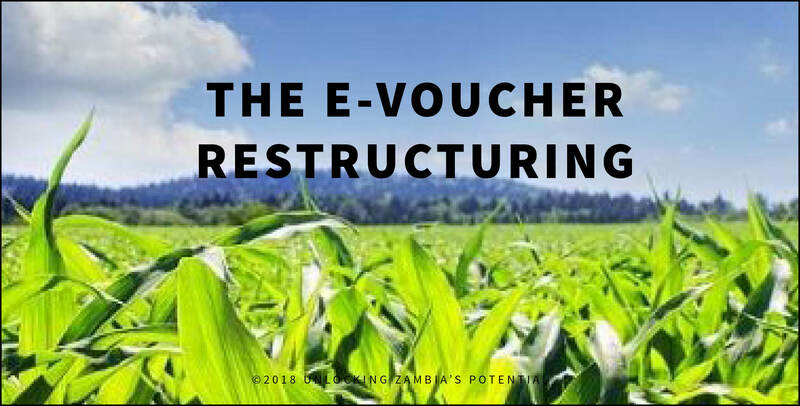 One of the several problems faced in the last farming season with this e-voucher administration system, was that banks were not uploading money as soon as Government released funds. Consequently, farmers received inputs late and this contributed to poor crop yields. However it is important to note that some banks performed exceptionally well last season regarding e-card activations. Banks have now been engaged on the need to promptly upload e-cards as soon as Government gives authorization. Our hope is that the 2018/19 farming season will be devoid of avoidable hiccups of late card activation. Banks are implored to continue operating optimally in their endeavors to support e-voucher implementation in the 2018/19 farming to help grow agriculture in the country. PMRC therefore advises all farmers that have made deposits to redeem their inputs effective 1st September 2018. We wish Zambia a productive 2018/19 farming season.